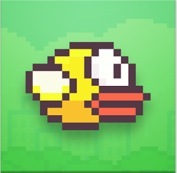 Surely you’ve seen the new number on app, “Flappy Bird”. It’s rise to number one has taken 6 months, and for good reason: it’s hard. VERY hard. It’s that difficulty that makes it so fascinating to me that it has reached #1 on both the Apple App Store and the Google Play store. (as of Feb. 3, 2014) It’s rise to #1 proves that people like hard work. It’s satisfying to work really hard, trying over and over again to make it through those menacing pipes. I admit, it is also a little frustrating! The first couple of times I played I thought I was doing something wrong actually, but it is just plain hard. I love that people enjoy the difficulty and have taken the challenge head on. Scores like “20” are something to be proud of. In fact when you get past the first pipe you jump for joy! It’s just one more piece of evidence that supports the growing body of evidence about how good games can be good for our students. Working really hard to get a decent score in Flappy Bird shows grit, determination and perseverance. Sure, it’s just a goofy bird that does not fly very well, but in the end that little Flappy Bird teaches us to hold on, keep trying and in the end we maybe, just maybe will get through more than one of those pipes. Go on, download it and see if you don’t agree with me.